Brief: Deliver 2 unique consultation experiences on board the Commonplace bus to launch the event space concept and gather ideas for the future development of the space. In 2017 Commonplace officially launched with a Big Lottery funded pilot series, designed to trial a variety of events on board the bus, launch the concept publicly and conduct consultations with our potential future users. We opted to run two different consultations - one with the public as a drop-in format, and the second as an invitation-only facilitated consultation for private sector users. As a result we hoped to understand the needs of our 2 key stakeholders - public ‘ticket-buying’ event attendees (customers), and private sector ‘bus hirers’ (clients). The first public consultation was held at Levenshulme Market during their popular Saturday daytime market. The aim of this consultation was to gather reponses to the presence of the bus, ideas for the interior design and layout as part of long-term conversion plans, and hear event ideas for what people would like to attend on the bus. We partnered with Friends of Levenshulme Station to deliver a screen printing workshop on the upstairs of the bus where passers-by could have a go at screen printing a tote bag which they could take away with them. 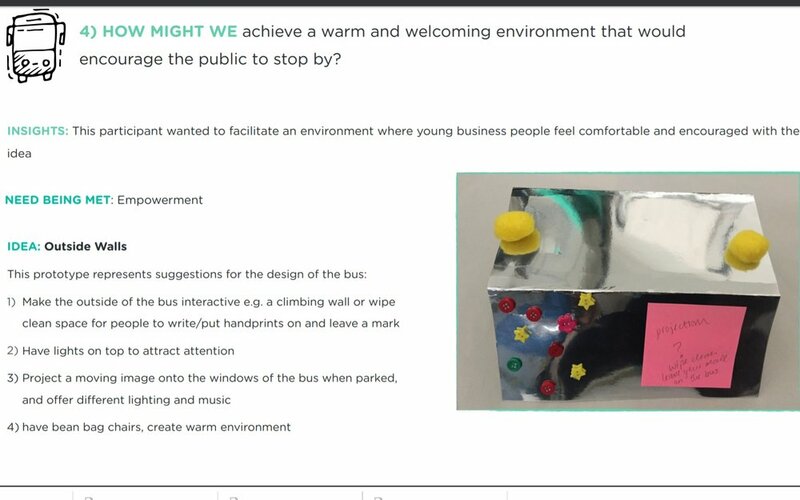 This worked well in both showcasing the bus in action as an event space and also having a ‘take away’ item as a thank you to consultation participants. Downstairs we hosted an informal consultation with easels displaying colour samples and furniture ideas, and swatches of floor coverings and materials to feel, for participants to give us ideas about the future design of the bus interior. Participants were invited to draw on the easels marking their favourite colourways or fabrics, and chatted with members of the Commonplace team about the concept. Additional feedback forms asking for event ideas were shared with those who stayed longer to chat. In general most participants stuck around to chat as they drank or ate items bought from the market and were intrigued by the orange bus parked in the middle of their usual Saturday morning social space! The second consultation event took place adjacent to the new Sadler’s Yard development in central Manchester, and was hosted in partnership with Plant NOMA and Amity HCD. The aim of this event was to look at the broader conceptual idea of the bus as an event space and gather ideas for how we could both market and design the space of the bus to suit the needs of paying customers who would hire the bus from Commonplace. We sent private invites ahead of the event to a number of corporate and public sector contacts to attend the event, and we had 8 attendees at a private workshop set-up. The workshop was design and facilitated by Amity HCD using their unique Human Centred Design consultation method. This event gave us a tangible working document of findings collated by Amity, that Commonplace could use for implementing ideas and presenting to funders and investors. Key outcomes: good footfall and exposure to bus ‘concept’ at Levenshulme Market, engaged a wide range of stakeholders from public and private sectors / client and customer, took away key feedback on bus design / event ideas / marketing approach, launched Commonplace! Key learnings: use a location where you are visible (more easily done with a bus! ), collaborate with events that already have a good audience, have something to give back as a thank you for participants time e.g. the tote bags at Levy Market and provision of refreshments at the private consultation, have personality - Roxanna and Lucy were present at the events to have a chat to people informally., be creative - participants engaged well with touching samples and building their own bus. Commonplace can help you design a public or private consultation, can house your next consultation in our eye-catching space and can help you reach new audiences. Why not get in contact.